1m White Angled Figure 8 Power Lead - Power Cable, UK 3 pin plug to figure 8 connector. 2 Port 4 Amp dual USB charger that fits in a UK mains socket. It is the perfect solution to either powering or charging your USB devices. 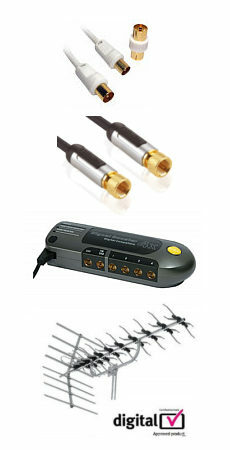 Ideal for for devices such as mobile phones, MP3 players and tablets. Output: 5V 4200mA (4.2Amp) 21 Watts Port Type: 2x USB A Female Input: UK Mains Plug, 100-240V ac 50/60Hz Protection: Over current protection Over voltage protection Short circuit protection Compact Design Contents: 2 Port 4.2 Amp USB charger. CE and RoHS Compliant. 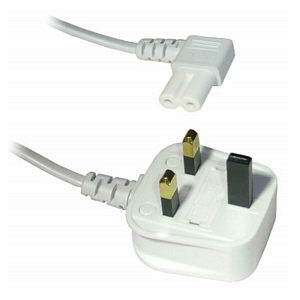 5m IEC Extension Cable, IEC Male to IEC Female C13 to C14 (kettle style). Voltage rating 240V AC. Current rating 10A Cable type, 3 Core. Colour black. Length 5m.